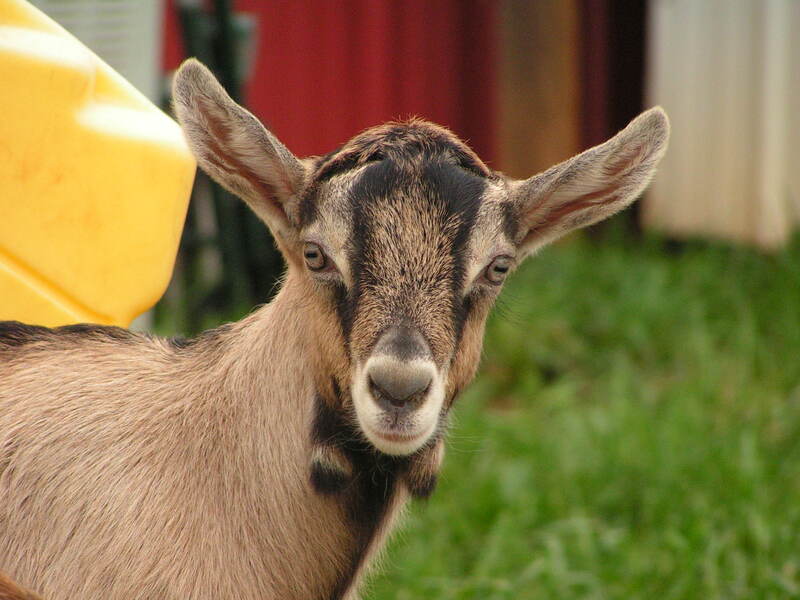 Last week, a Charlottesville-area television station had a short segment on local goat dairies. Included in the spotlight were Night Sky Farm of Brookneal, Caramont Farm of Esmont, Goats R Us of Blackstone, and Iron Rod Chevre of Earlysville. You can view the clip on the Edible Blue Ridge website. It’s been a very busy week, so I apologize for the lack of updates. I worked all through the weekend, and on Monday I had the opportunity to spend the day with Jennifer Downey at Night Sky Farm (link above and under the “Favorites” tab). It was a wonderful, informative day. I arrived in time to “help” with the morning milking of 13 does and her wonderful Jersey cow, Emily. Jennifer has a wonderful team of helpers and the milking runs like a well-oiled machine. While the does were milked, I learned about udder structure and mammary attachment by viewing a variety of udder shapes and sizes. Once the milking was complete and the machines were cleaned, we headed up to see the “nursery” where all the older kids are kept, ranging from 4 days to several weeks old. Part of the reason for the trip was to inspect prospective bucklings — HB and I are debating over purchasing our own buck for the upcoming breeding season, “borrowing” a buck from a friend, taking does to a buck, or investing in artificial insemination (the least likely option). Jennifer has 2-3 buck kids that have potential AND come from completely unrelated bloodlines from our does. We just need to decide what we want to do. And decide quickly! Once we had played with the kids, we went to the make room where I got to learn a little about her cheesemaking process and pasteurization. We wrapped up the day with a visit to her bucks and junior herdsires. The young bucks were really cute – still on the small side, and so curious. I adore the way bucks seem to have the little tuff of hair on their foreheads. The buck our Toggenburg, Xenia, is bred to has a big curly forelock. Let me just say, that while the day was very educational, it was just a lot of fun to see all the goats and watch them interact, soak up some sun in the pasture, and play with the KIDS! Today my mother in law had surgery to remove a small growth in her breast. She was diagnosed just over a month ago, and after a series of tests finally had the tumor removed. Her surgery went well, and we’re hoping that the pathology reports will come back next week with clean margins. We spent most of the day at the hospital, but were able to come home and within a few hours HB had put the floor on the goat shed for the hay loft. I stayed inside to do a few chores and clean the barn a little. Last fall HB stumbled upon a cheese magazine entitled Culture. Two copies were given to him by the owners of a local meat & cheese shop. At $10/each, this wasn’t a cheap gift. HB brought the magazines home and we devoured them. 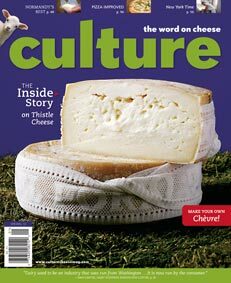 Great articles, beautiful photographs, and delicious cheeses filled every page. One of the first issues featured Virginia’s own, Pat Elliot and Everona Dairy. It’s a really interesting, beautiful magazine. A few stores in south central Virginia have begun to stock it as well. For more information, check out their website. It's not Camembert, but what is it? 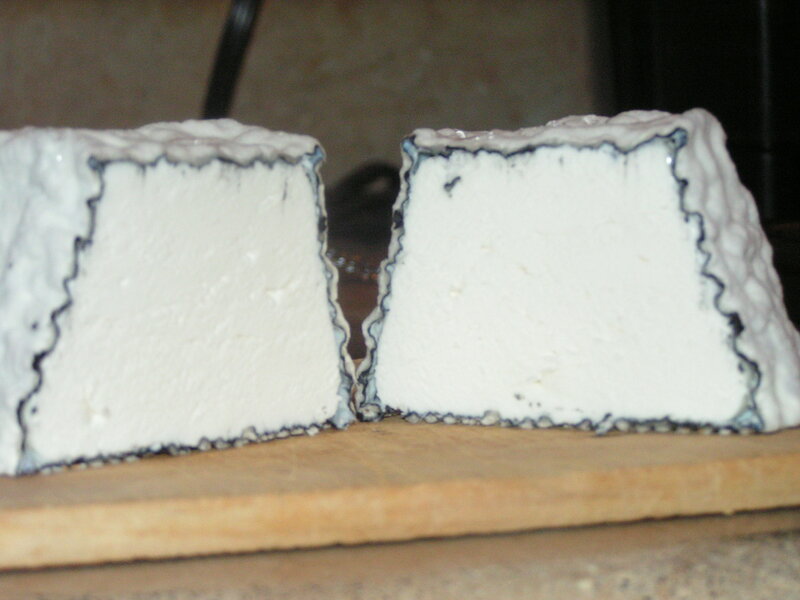 In November 2009, using the last gallon of milk from Anita, HB attempted to make a goat’s milk Camembert. Nearly two months later, we decided to try the cheese. What we had wasn’t Camembert, but rather something much harder. HB took a sample with us to Caromont to review it with Gail Hobbs-Page, and it was decided that what we had created was something more reminiscent of a an aged Spanish cheese. Interesting. The flavor was good, the cheese perhaps a little too hard (think, aged Parmesan), and we had a few air bubbles in the wheels. HB discussed the cheese with Gail, pulling out his notebook where he writes his cheesemaking notes, and reviewing the process. It was decided that to make Camembert we needn’t cut the curd, but rather just ladle the curd into the molds. Cheese making is all about the technique, you know. Over the end of last week I saved up two gallons of milk from Jacqsonne (about 3 day’s worth of milk) for us to turn into a second attempt of Not Camembert. 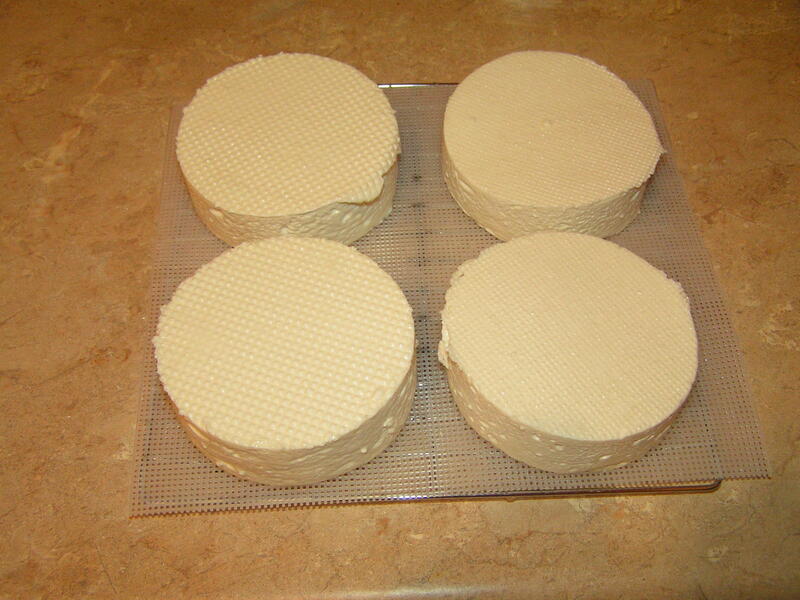 The picture above is the following day, after removing the cheese wheels from their molds. So far, so good. The wheels are aging away in our converted wine fridge. It will be interesting to see how these wheels compare to the last attempt!